How some writers are pushing the view that tribal people are particularly violent. Survival exposes the ‘Brutal Savage’ myth by examining the recent work of some ‘popular science’ writers, who claim that tribal peoples live in a state of ‘chronic’ violence. In The Better Angels of Our Nature (2011), Steven Pinker promotes a fictitious, colonialist image of a backward ‘Brutal Savage’, which pushes the debate on tribal peoples’ rights back over a century and is still used to justify their destruction. Read more about why Pinker’s ‘science’ is wrong. Steven Pinker would arguably not have been able to reach the conclusions he does about tribal violence without the highly controversial work of a single anthropologist: Napoleon Chagnon studied the Yanomami tribe from the 1960s, calling them ‘The Fierce People’. But are the Yanomami really fierce? Napoleon Chagnon’s view that the Yanomami are ‘sly, aggressive and intimidating’ and that they ‘live in a state of chronic warfare’ has been widely discredited. Nonetheless, both Diamond and Pinker’s conclusions about tribal violence rely heavily on his work. Jared Diamond’s 2012 book, The World Until Yesterday is ostensibly about what industrialized people (whom he calls ‘modern’) can learn from tribal peoples (he calls them ‘traditional’). His book, however, carries a false and dangerous message – that most tribes engage in constant warfare, both needing and welcoming state intervention to stop their violent behavior. Read more. On 11 June 2013, Truthout published an article by Survival director, Stephen Corry, about Steven Pinker’s book The Better Angels of Our Nature: The Decline of Violence in History and its Causes. Comment on the Truthout article. Read the full annotated version here. Open Democracy published the full version of the article. Truthout has just released an article by Survival director Stephen Corry about Chagnon’s latest book, Noble Savages. Portrayals of Indians as violent savages remain common. Perhaps the worst recent example of this characterization comes from the controversial US anthropologist Napoleon Chagnon, who carried out fieldwork with the Venezuelan Yanomami from the 1960s. On 19 February 2013, Chagnon released his autobiography, Noble Savages: My Life Among Two Dangerous Tribes – The Yanomamö and the Anthropologists. Carlo Zacquini, a Catholic lay missionary who has worked and lived among Yanomami for nearly 50 years, ‘never found them to be violent’. Hear what Davi Kopenawa, a Yanomami spokesman and President of Hutukara, had to say about The Fierce People and Noble Savages in interviews with Survival. In an excerpt taken from La chute du ciel, Paroles d’un chaman Yanomami, by Davi Kopenawa and Bruce Albert, he discusses the violence of Western societies. Whilst a few Yanomami may die in conflicts, far more have been killed by outsiders in violent attacks or by the diseases they have brought in. Today our real enemies are the gold miners, the cattle farmers and all those who want to seize our land. Our anger must be directed at them. That’s what I think. 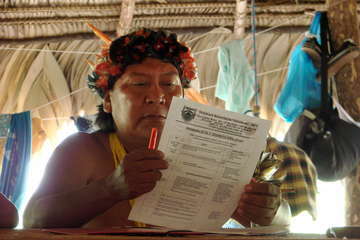 Davi Kopenawa at Hutukara Yanomami Association&apos;s 3rd general assembly November 2008. In 2004, Yanomami from 11 regions in Brazil met to form their own organisation, Hutukara (meaning ‘the part of the sky from which the earth was born’), to defend their rights and run their own projects. The greatest tragedy in this story is that the real Yanomami have largely been written out of it, as the media have chosen to focus only on the salacious details of the debate that rages between anthropologists, or on Chagnon’s disputed characterizations. Rarely mentioned is the fact that The Fierce People had disastrous repercussions for the Yanomami, and tribal peoples in general. Read how Brazil’s military dictatorship was influenced by the characterization of the Yanomami as hostile to each other. See why UK government refused to fund an education project with the Yanomami. More recently Chagnon’s research has been used by Jared Diamond in his controversial new book, The World Until Yesterday: What Can We Learn from Traditional Societies? to back his erroneous claim that ‘most’ ‘traditional’ societies like the Yanomami exist in a state of ‘constant warfare’; that they are far more violent than industrialized societies; and that they welcome ‘pacification’ by the state. Diamond’s book has been condemned by Survival director Stephen Corry, indigenous organizations and academics, and his arguments compared to those of European colonists, who sought justification for the brutalities of imperialism. Visit Anthropology Report blog for a comprehensive guide to what anthropologists are saying about Noble Savages. 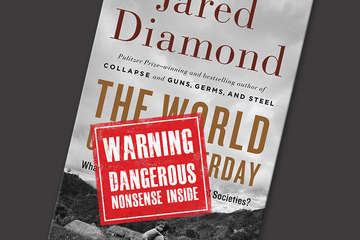 On 30 January 2013, the Daily Beast published an article by Survival director, Stephen Corry, about Jared Diamond’s book The World Until Yesterday. Jared Diamonds book has come under attack for portraying tribal people as warlike and living in the past. Take Part published a shortened version. Die Welt published a German translation of the article on 5 February 2013. Find out what West Papuan tribal leader Benny Wenda thinks of the book. Listen to a 15-minute interview with Stephen Corry broadcast on 31 January 2013 by WBEZ (formerly Chicago Public Radio). Diamond believes that tribes welcome the imposition of the state. Wamaxua Awá, one of the most recently contacted people in the world, disagrees. Find out why angry Papuan leaders demand Jared Diamond apologizes. See Yale professor James C Scott’s devastating critique in the London Review of Books. Read anthropologist Ira Bashkow’s review, published in The Times Literary Supplement. On February 4 2013 Jared Diamond was interviewed on BBC TV about his new book ‘The World Until Yesterday’. He would not agree to a Survival representative being there to debate his points. He has also given many other interviews (e.g. BBC Radio 3 Nightwaves). We have reproduced some of his claims, and our responses to them.